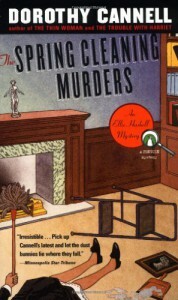 The Spring Cleaning Murders, An Ellie Haskell Mystery by Dorothy Cannell is a quick cozy mystery to read. Because it kept me guessing, I gave it four stars. Ellie's family meets a new housekeeper, Mrs. Large. "'Morning, all.' Her voice was deep and gruff and--as might be expected--she was definitely a big woman. A good six-feet tall, with a long lugubrious face and a plodding walk." Ellie is thinking about the loved ones in her life: "the heart has many nooks and crannies, each of which can only be filled by certain people."